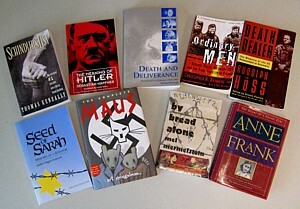 Feb. 4, 2008: Cathryn (and I) recommend this 3-hour 2005 BBC miniseries "Auschwitz: The Nazis and the Final Solution," published in book form as Auschwitz: A New History. It is available on the web, broken into 9 segments (click through to view): list of 9; direct link to 1. Feb. 4, 2008: I don't think the annotated bibliography assignment is working out very well (I don't think that is very useful). I'd like to discuss this with you more next week. I think the entries should be more focused around content, or specific questions. Women's Sexuality in the Concentration Camps, an oral history project at UC Berkeley that is now defunct (web archive version). I'm just putting this here to keep access to it (goes best with Seed of Sarah). 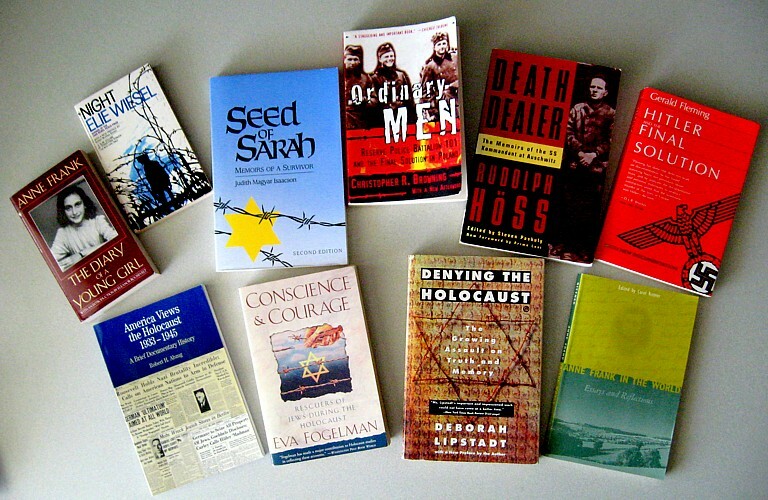 Hist 133Q, "Readings in Holocaust History," is one of my favorite courses to teach, because we read the best books on a subject and discuss the issues they raise in great dept. I first taught this seminar in 1998, twice in 1999, then again in 2001, 2004, 2006 and 2008 (see the syllabi: 1998, 1999 winter, 1999 fall, 2001, 2004, 2006, 2008). Basically, in this seminar of about 15 students, we read a book a week (long or thematically complex books are spread over 2 weeks). Each week teams of 2 or 3 students work with me preparing background material and help to lead the discussion, while other students either write a 2-page essay on a guiding question, or formulate 6-10 questions of their own. Each student also prepares a more substantial paper on their book or topic. Each time I offer the course I keep some of the students' favorite books from the previous time, and choose a theme to guide the rest of the selection. 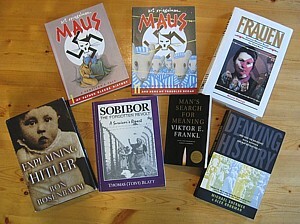 Anne Frank's diary (1946 etc.). 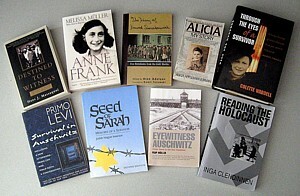 Anne Frank and the World (1998), a collection of essays about using Anne Frank's diary in the classroom. I didn't assign the scholarly essays to everyone this time, but helped the presenting teams to find appropriate background readings. Instead, I started using the guiding questions for the rest of the class, and finishing up the readings with a more challenging book. 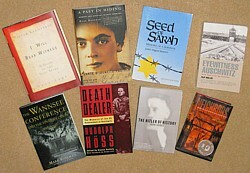 Isaacson's Seed of Sarah (1990). Australian anthropologist Inga Clendinnen's reflections on Holocaust historiography Reading the Holocaust (1999). 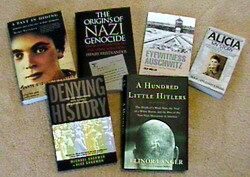 Elinor Langer's 100 Little Hitlers on a skinhead murder of an African immigrant in Oregon (Langer had presented her book on the UCSB campus the preceding quarter). Jan Gross's Neighbors, a study of a massacre in an eastern Polish town. Klemperer, Wannsee and Lukacs on Hitler I've never used before; I tried Gross in a 4-unit GE freshman seminar in 2003, and it didn't work (too challenging). Dec. 12 , 2007: I don't have the prerequisite--can I enroll in this course anyway? 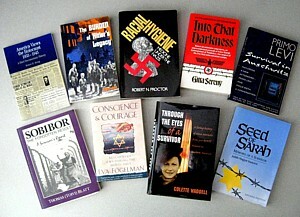 Jan. 7, 2008: The 2008 syllabus is now available. See my Maus Resources page for next week. Jan. 23, 2008: Please note that tomorrow, Thu. Jan. 24, Sobibor survivor Thomas Blatt will be speaking in HSSB 4020, 12:30-1:45pm. He is the author of our reading for week six, Feb. 25.
also, I have uploaded Erin's annotated bibliography for Maus as an example for how to do these. I would like to discuss your reactions in our next class meeting. And don't forget: next Monday, Jan. 28, at 5:30 at 524 Chapala St., Alison Owings will be presenting about the women in her book Frauen. Jan. 28, 2008. For directions to tonights presentation, see the bottom of the Jan. 28 announcement on my Hist 133D webpage. Alison Owings will be joining us in class today until 3pm.